Are you swimming in the sea of summer corn and zucchini? 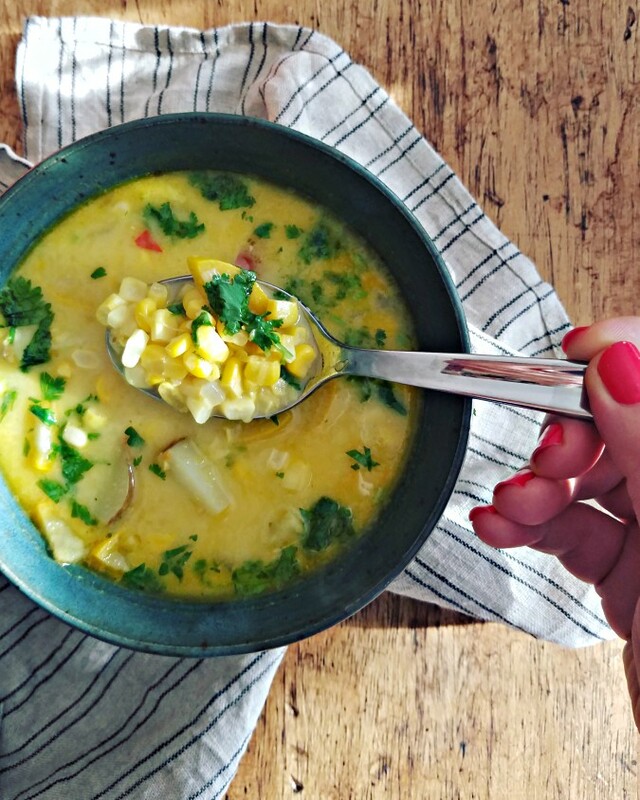 If the answer is yes, then this Vegan Thai Corn, Potato & Zucchini Soup is perfect for you. I saw a recipe for Thai-Style Corn Chowder on TheKitchn and adapted it slightly to fit what I had on hand. First, I used only 2 red skinned potatoes, and added 2 large zucchini. I also used vegetable broth instead of chicken broth. Finally, I pureed part of the soup to improve the texture. The one recommendation I'm still figuring out is whether to mince the lemon grass*** or simply bruise it using the back of the knife because I did not like the texture of the minced lemongrass in the soup. You decide! 1. Heat a heavy bottomed soup pot on the stove. Add olive oil and allow it to heat. 2. Add chopped onions and allow to cook until translucent. 3. Add potatoes, chili pepper and lemongrass and saute for 5 minutes. 5. Add just enough broth to cover the vegetables, bring to a simmer and cook 5 to 8 minutes, covered, until potatoes are tender. 6. Add corn and zucchini and the rest of the broth. Bring to a simmer and continue cooking for a few more minutes. 7. Fish out the lemongrass and discard. 8. Off the heat, add coconut milk. 9. Carefully ladle a few cups of the soup into a blender. Blend until smooth and add back into the soup pot. 10. Serve the soup garnished with cilantro and a squeeze of lime juice. *** Rereading the recipe, I noticed the lemongrass was finely grated, not minced. Oy. Clearly I did not pay enough attention.